You may be in a situation where you have disabled AllowAdHocSubscriptions for Azure Active Directory within your organization. This will prevent the ability for users to signup for Power BI. If your organization has this enabled, and no one has signed up for Power BI, you will not see the Power BI (free) license block within the Office 365 Admin Center. The question becomes how do we get the license block in place to provide users access to Power BI using the free option? You have two options. Having one user sign up will get the license block within your tenant. Enabling AllowAdHocSubscriptions will allow you to sign up a user. You can then disable AllowAdHocSubscriptions again to block the sign up capability. The following block shows how to enable and disable AllowAdHocSubscriptions with Azure Active Directory and PowerShell. You may not be able to enable AllowAdHocSubscriptions, or don’t see option 1 as a viable option. If that is the case, you can do the following. Select Add subscriptions + on the right side. There is no purchase when using this approach. It has a zero cost. You can enter the number of licenses that you need. 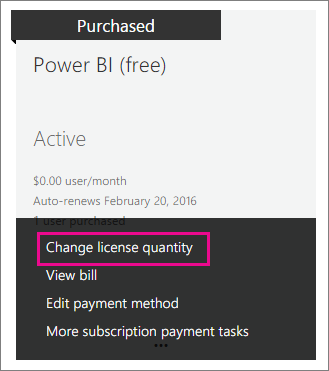 If you find that you need additional license, you can go back to this page and select Change license quantity. Once you have the licenses available, you can then assign them to accounts within your organization and start to use Power BI!